A fortnight ago we noted with interest that an Intel pricelist floating around the web appeared to show the first ever unlocked Core i3 processor, destined for the Kaby Lake desktop range. The Intel Core i3-7350K offers the expected 2C/4T configuration of an i3 chip, provides a boost frequency of 4.2GHz out of the box, and its 'K' suffix marks it out as a chip with an unlocked multiplier. Interestingly a couple of Geekbench scores, ostensibly from systems equipped with this chip, have recently been published. Of course we would be interested to see how this chip will perform out of the box, and how well it might overclock. 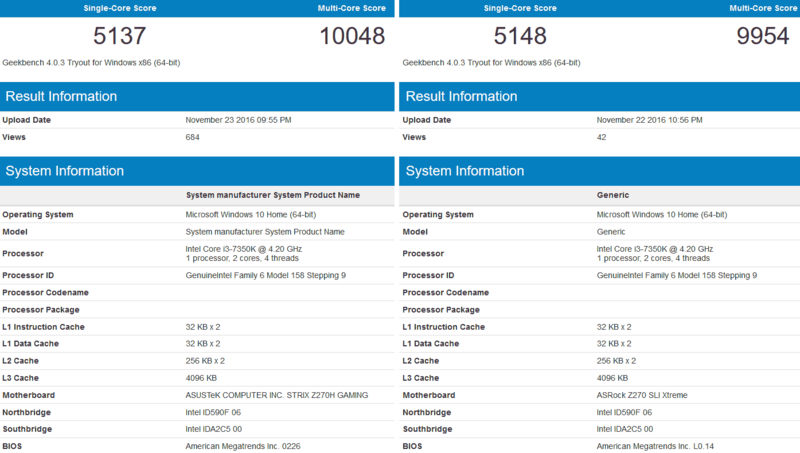 Unfortunately these 'leaks' only provide Geekbench scores at the default 4.2GHz boost clock but they are interesting nevertheless. 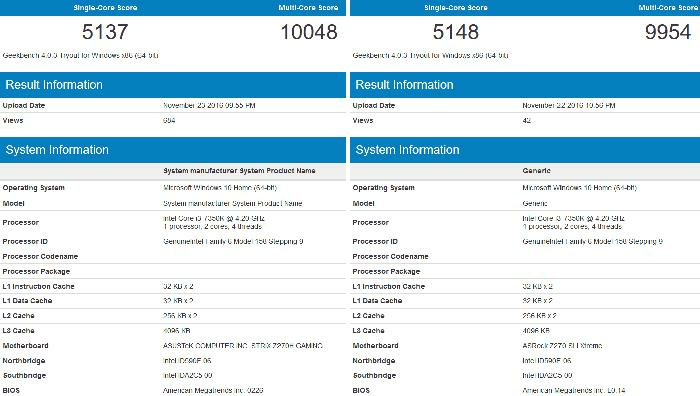 Above you can see screengrabs of the two recent Geekbench tests of systems sporting Intel Core i3-7350K processors. You can see beyond the headline single- and multi-core scores by visiting the link above. So how does this chip compare to others available right now? OC3D compared the it to Skylake and Haswell 'K' Core i5 chips and found the new Intel Kaby Lake Core i3-7350K CPU beat them both - in both single- and multi-core scores. See below. The above i5-6400 runs at 2.7GHz base/3.3GHz boost, and the i5-4670K runs by default at 3.4GHz base/3.8GHz boost. In single-core tests the clock speed of the Kaby Lake i3 really does make it pull away from its rivals. In multi-thread application tests its really quote close between the 2C/4T i3 and its more premium 4C/4T rivals. So the Core i3-7350K looks like an interesting option but we must remember it will be priced up at the top of the Core i3 range, not that far from Core i5 territory. Intel isn't likely to cannibalise its Kaby Lake Core i5 range to make value buyers happy. In the previously published price list this unlocked i3 was $177 and the cheapest i5 was $195. As usual, all will become clear when these components launch officially, we get to see retail prices, and they can be real-world tested by enthusiasts. So you are better with new i3 than old i5? Is that Intel feels Zen heat? More than likely Intel will price it for its performance rather than its predecessor's price point. So we'll end up with i5-priced i3s, K priced non-K i5s, i7 priced i5 Ks, and 28 lane E priced i7s. I'd still rather have 4 slower cores than 2 faster cores going forward. Games and apps are becoming increasingly multithreaded and its quite computationally slow to swap threads. I expect a real life scenario would show the i5 doing far better! The sad thing is that we have already got those prices. I never thought I would see the unlocked i5 at £230+. That is where the i7 4770k launched at and is obscene. I really hope AMD can pull something out of the bag and give Intel some competition that forces prices down. Unfortunately I have a nasty feeling that if Zen is any good that they will be pricing them around Intels prices. 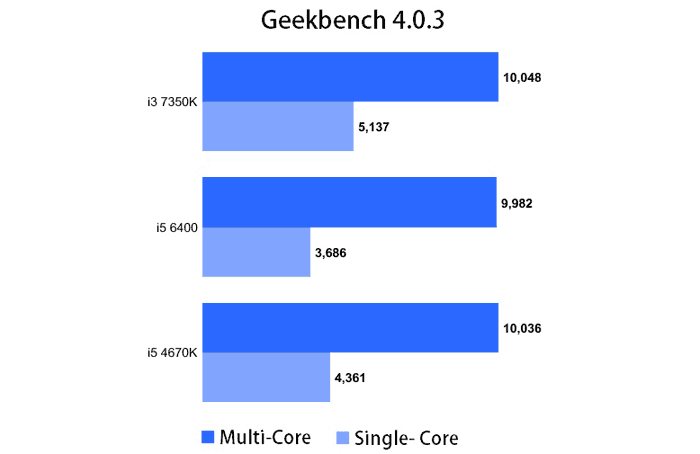 Never really trusted geekbench if I'm honest…. Personally I'll wait until I see some cinebench numbers before saying a 2+2 hyperthreaded core i3 is as fast as a pure 4 core i5 cpu when it comes to multithreaded performance.